The eighth century Anglo-Saxon king Offa of Mercia must have been an impressive and powerful king to his contemporaries. Offa could make the claim of being the first “king of the English”. While he consolidated quite a bit of the kingdom, he did have some trouble holding on to all the parts of it. But his true ambition was power and power alone, not necessarily the unification of England. Offa was named for an earlier Offa, king of Angeln, one of the fabled ancestors of the Mercian royal dynasty. He was the son of Thingfrith and claimed to be a descendant of Eowa, a mid-seventh century Mercian king and brother of the celebrated King Penda of Mercia. Offa was a cousin of King Aethelbald of Mercia who reigned from 716 to 757. 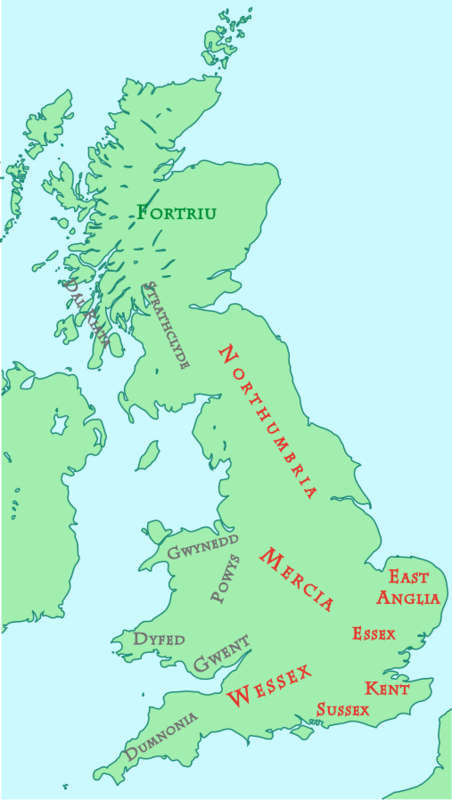 During Aethelbald’s reign, Mercia was restored as the dominant Anglo-Saxon kingdom in England as it had been under King Penda after a period of anarchy. For unknown reasons, Aethelbald was murdered, possibly by his own bodyguard and he was succeeded by Beornred. After a period of civil strife, Offa dethroned Beornred. While the records of Offa’s early reign are spare to non-existent, we can gather information from other sources and better records from later in his reign. After winning the throne, Offa began his road to supremacy with sword, political astuteness and bloodshed. While earlier kings were content to rule without venturing into internal affairs of subsidiary kingdoms, Offa’s method was to demote or even remove local kings and absorb them into his Mercian empire. The first kingdom to feel his wrath was Sussex. Offa conquered the people in the Hastings area in 771 and the local rulers were reduced to dukes or ealdorman, becoming appointees who ruled in Offa’s name. Next Offa relegated the local rulers of the kingdom of Hwicce to kinglets or sub-kinglets. By 780, there was no evidence of a local dynasty in the area and it was ruled directly by Offa. In 762, Offa took advantage of the turmoil in Kent after the death of King Aethelbert II and by 764, Offa appears to have set up his own man there. But Kent was not going down easily. We don’t know the exact circumstances leading up to the battle but in 776 the Mercians met the men of Kent at Otford, near Sevenoaks. The Anglo-Saxon chronicle doesn’t tell us exactly who won the showdown. Despite his superior forces, the most likely outcome was a Mercian defeat as Kent retained its independence for a number of years. Offa kept up the pressure and the last known charter issued by a local Kentish ruler was in 784. Offa may never have established complete hegemony over Kent but perhaps Mercia retained some nominal control there until it was conquered by Egbert of Wessex in the ninth century. In the mid-750’s London and the Thames came under the control of Mercia. Offa was on good terms with the kings of Essex and he may have relied on them to administer the major port of London. This was important for his reign because Offa took an interest in foreign trade and a connection was formed with the overseas trade route out of London along the Thames and also with Canterbury. This made it easier for him to establish relations with the Frankish court of King Charlemagne. Offa was now forced to fight against King Cynewulf of Wessex. Cynewulf was defeated at the battle of Bensington in 779 and he recognized Offa as sovereign. But he never submitted to Mercian overlordship. Offa managed to regain a lot of lost and disputed territory in the upper Thames valley but it wasn’t until the death of Cynewulf and the accession of Beorhtric that Offa could claim Wessex was subservient to him. He married his daughter Eadburh to Beorhtric and she ruled Wessex in her father’s name. In 778 and again in 784, Offa set his sights on Wales where he made many raids. 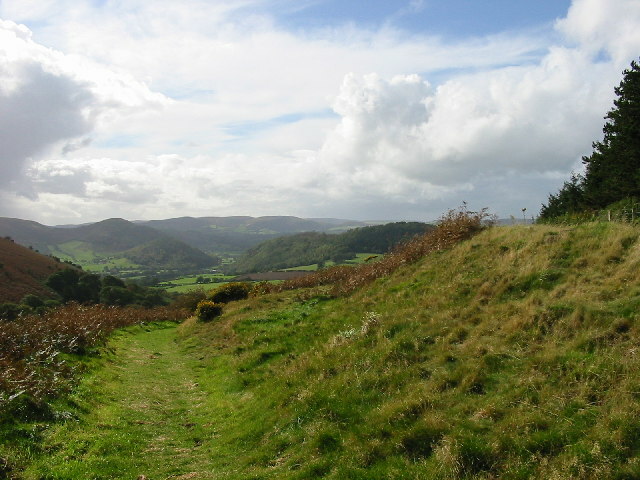 He eventually established a border with Wales by building what is now known as Offa’s Dyke. The Dyke runs one hundred fifty miles (or sixty-four miles depending on who you read) from the estuary of the River Dee in the north to Tidenham on the River Severn in the south. The exact nature of the earthwork is unknown and it most likely wasn’t manned. It wasn’t so much of a defensive work as a border, distinguishing the demarcation of Wales and Mercia and may have been built in the hope of keeping peace. Offa’s Dyke was an engineering feat, taking many years and men to build. The men of Powys and Glywysing were probably forced into labor. The engineer who designed the dyke used natural features to make it harder to cross and it effectively ended “hit and run” raids by the Welsh. It was a clear sign of Offa’s power. Offa’s wife was a woman named Cynethryth who may have been descended from Anglo-Saxon royalty or of Frankish origin. Together they had one son, Ecgfrith and at least four daughters, two of which were married off to kings to make alliances. As stated, Eadburh married the King of Wessex and Aelfflaed was married to King Aethelred I of Northumbria. It doesn’t appear that Offa ever held any hegemony over Northumbria. Another daughter named Aethelburh became an abbess. There was a daughter named Aelfthryth or Alfrida who appears in the record but there is no clear evidence she actually existed. Her story is related in the tale of King Aethelbert of East Anglia. The record states that in 794, King Aethelbert came to the court of Offa at Sutton Walls in Hereford, apparently to marry Offa’s daughter Aelfthryth and maybe form some kind of coalition. For unknown reasons, on the orders of Offa or Cynethryth, Aethelbert was murdered. Perhaps Aethelbert was trying to break free of Offa’s rule. He later became a saint, also for unknown reasons. It was highly unusual for one king to kill another unless there was betrayal or treachery. After Aethelbert’s death, Offa assumed complete control of East Anglia. From the 780’s onward, Offa may be considered the most powerful Saxon monarch to rule England up to that point in history. He only preserved his position by bloodshed and exploitation. The Pope allowed Offa to appoint his own archbishop. Hygeberht was named as the first and only archbishop of Lichfield and in 787, Hygeberht crowned Offa’s son Ecgfrith his successor as king of the Mercians. This ceremony was unprecedented and indicates Offa considered himself as king of the English. By doing this, Offa was imitating Charlemagne who in 781 had his two sons anointed by the pope in person. In 789, Charlemagne made an agreement with Offa to marry his son Charles to one of Offa’s daughters. Possibly at the suggestion of Cynethryth, Offa made it a condition that his son Ecgfrith should marry one of Charlemagne’s daughters. Charlemagne was so offended by this he suspended trade relations with England. It was only after negotiations with clergy that trade contacts were resumed and neither marriage was ever completed. 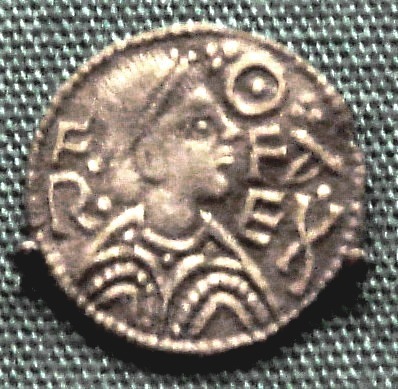 Offa adopted the idea of a silver penny from a former Kentish king or possibly Frankish models and made the penny the basic coin of his realm. He established a mint in London. In a most unusual move, he was one of the first medieval kings in the west to put the face of his wife on a coin. Both Offa and Cynethryth were patrons and builders of monasteries, most notably Winchcombe, St. Albans and Bedford. King Alfred the Great, in the ninth century mentions that he based his codified laws on those of Offa but Offa’s codes no longer exist. King Offa died on July 29, 796, most likely in his sixties and he was buried at Bedford. While he was one of the most powerful and significant of the Anglo-Saxon rulers, he wasn’t regarded as an equal of those on the continent. He did attempt to be wise and practical but he was vindictive, ruthless, vain and ambitious. The building of the Dyke was the single biggest man-made legacy from the Anglo-Saxon period of history and Offa’s greatest monument. He did his utmost to groom his son for kingship and pave the way for him to succeed him and possibly rule over all of England. His plans never came to fruition as Ecgfrith died within a few months of his father, leaving no heir. The kingdom of Mercia passed on to distant cousins who never achieved the authority of Offa. In an interesting side note to Offa’s story, in the early eleventh century, Aethelstan, the eldest son of Aethelred the Unready bequeathed to his younger brother Edmund Ironside the sword which had belonged to King Offa. Wouldn’t it be fabulous to know where that sword is now? Wonderful writing. Is it fantasy that Offa was buried In Bedford?. There is much local tradition to say he was, perhaps on an island in the middle of the Great Ouse, there are many here. Maybe Offa adored his wife , is why he had her on his coinage. Dark age romance, love it. Lovely History of Wales. For those who want more. Thank you I enjoyed this and the page on Cynethryth. I would suggest that if the queen was on record as immersed in textual correspondence on behalf of Offa and the dynasty, then Offa as a fighting man may have been illiterate or far less literate than she was. Such partnerships have worked well at other times and places. Having her head on coinage suggests to me that the queen was extremely wealthy and well connected, bringing her husband substantial advantages to consolidate his position. Medieval women often became powerful as stewards and regents for husbands and sons. It is possible that this queen Cynethryth was a determined enough person to insist on the kingdom’s coinage recognizing her. Her powerful position and her loyalty, together with being mother of the heir, would make it not that difficult for Offa to agree. We must be careful not to assume that the male partner necessarily initiated or made such a decision, as this degrades the woman’s role in the matter. Also vice versa obviously. That Offa’s reign instituted a much stronger distinction between legitimate heir and illegitimate child, strongly suggests his queen wife’s hand. To a military minded king there was not a lot of difference – it was his blood either way, and the important thing was to hold his winnings together under the rule of his child. It’s the woman who would want her children privileged over any others. Over the border in Wales right next door this distinction was not made and Wales continued to run inheritance differently until the 13th C. when English rule increasingly changed it. On the famous dyke my understanding is that a dyke or wall such as the one the Romans built, is not about stopping people from moving about. But it does stop them going home again with cattle, horses, or sheep. Climbing and leaping is one thing, heaving large animals another. Forgot to put that the accusation that the queen murdered another royal looks like faction politics. It was written by a churchman supporting Offa, or dependant on him, same thing. Perhaps the queen and king had a falling out so she was accused? Or she antagonized a Church faction – they didn’t always like strong queens unless the queen was otherwise submissive to the Church. Or she did do it. Or she and Offa did it and she got blamed. History is fun like that. Again all excellent points. And yes, history is jolly good fun! All excellent points Shan. Thanks for stating them. I’ve always had a special fascination for Offa, having lived on both sides of his Dyke, and seen how Welsh people even now respect it as a boundary of their true country! What an ambitious undertaking that was, but these Anglo-Saxon kings (the good ones anyway) never seemed to lack vision or ambition. That is how they achieved such greatness! I am also intrigued by the shadowy womenfolk who are always married off so conveniently (although some of them could bite back!) And yes, wouldn’t it be great to find Offa’s sword? I have always wanted a metal detector! 🙂 Lovely article as always, Susan. Thanks Jo! While researching this king, I too became fascinated and came to admire him. I’m sure his contemporaries had great respect for him. I think you should get a metal detector Jo. How fun!